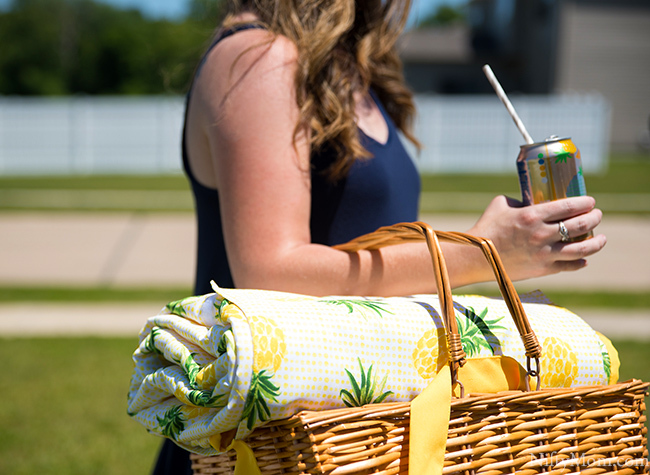 Summer picnics are a refreshing way to cool down in the middle of a busy day or to add excitement on an ordinary day. 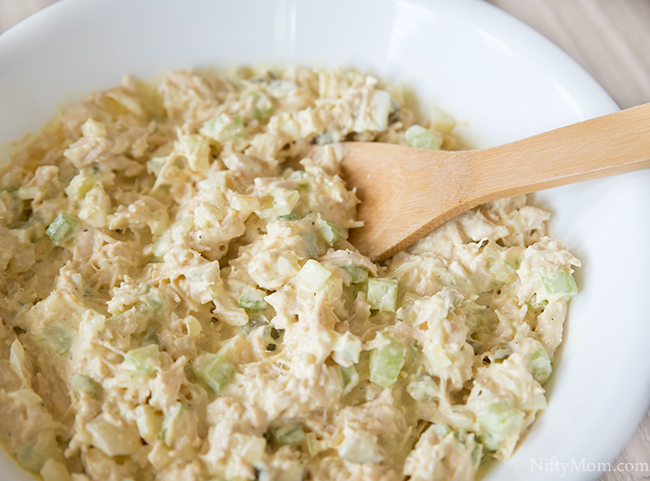 This chicken salad recipe is a great make-ahead dish, which is exceptional for easy-prep picnic chicken salad wraps. With school out for the summer, I have to keep the kids entertained and engaged more than ever. My six year old gets bored extremely easy and is consistently in need for new captivating activities. This summer, my sister-in-law and I are trying to do at least one adventure a week with our kids. This gives us and the cousins something to look forward weekly. One thing we penciled-in almost every week is a trip to various local parks, along with a picnic. At times, after a walk or hike around the park, my sister-in-law and I get a refreshing picnic while the kids play on the playground. Each trip, we have our picnic basket packed and at least once a week we are at Target to make sure we have enough drinks, food and supplies. On a hot summer day, a cold can of Aquafina Sparkling hits the spot. This year, Aquafina Sparkling relaunch as a new entrant into the Unsweetened space – reformulating with zero calories, zero sugar, and zero artificial preservatives– and introducing 2 new flavors in an 8 pack option: Mango Pineapple and Black Cherry Dragonfruit (along with the Lemon Lime and Orange Grapefruit flavors). They provide the perfect balance of fun and a hint of flavor, in the right package and at the right price. 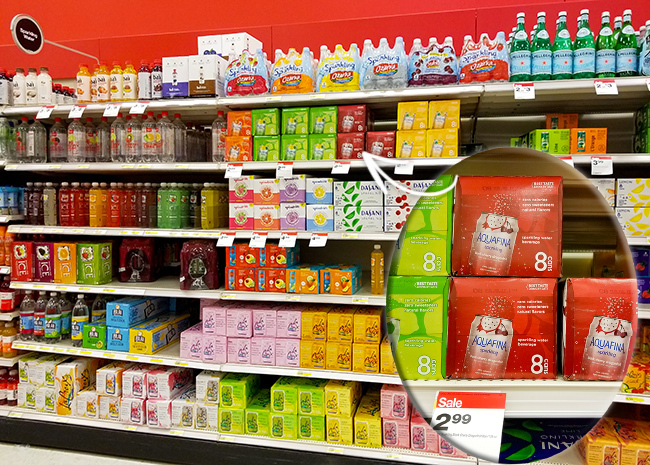 I made sure to pick up a couple 8-packs at Target the last few trips, because there is a Cartwheel offer for 25% any Aquafina Sparkling 8pk flavor, running from 5/21 through 6/17 (click above to get the offer or here). 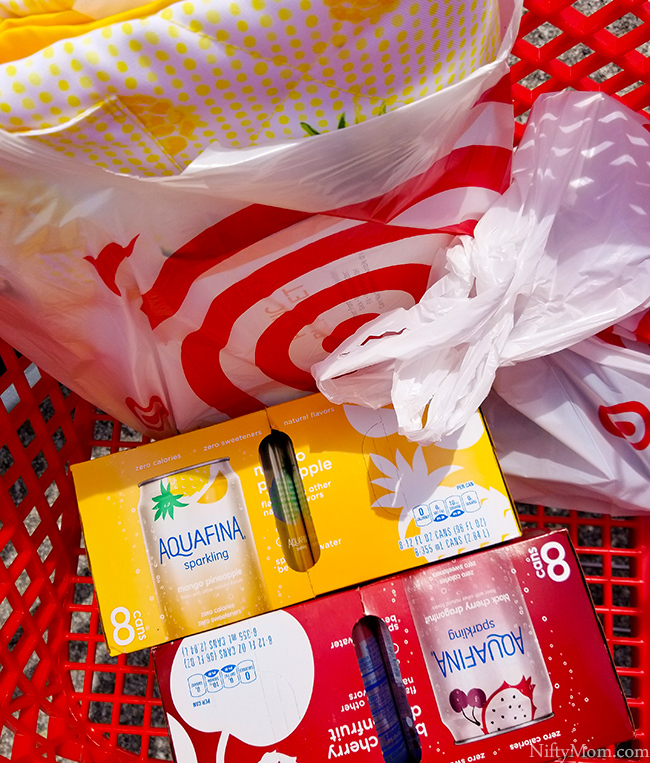 Be on the lookout while shopping, as there will be tastings/samplings of Aquafina Sparkling in certain Target locations across the US. Like most Target runs, the last visit I purchased more than intended. It included a new picnic blanket to keep in the car so we always have one for last minute. I mean, we all need at least five picnic blankets on hand, right? 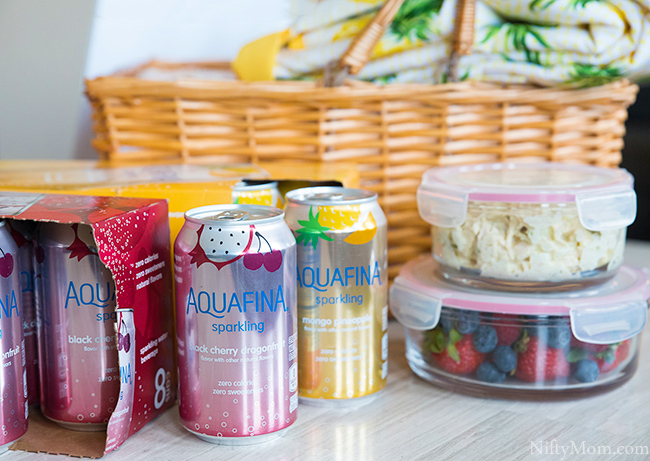 While Aquafina Sparkling is great to have when I am on our adventures, I also have to come up picnic-friendly lunch/snack ideas each week. 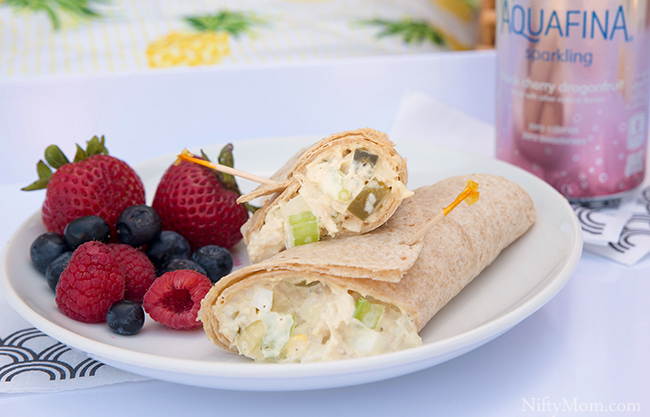 I recently starting using my husband’s easy chicken salad recipe for wraps to take along on our outings. 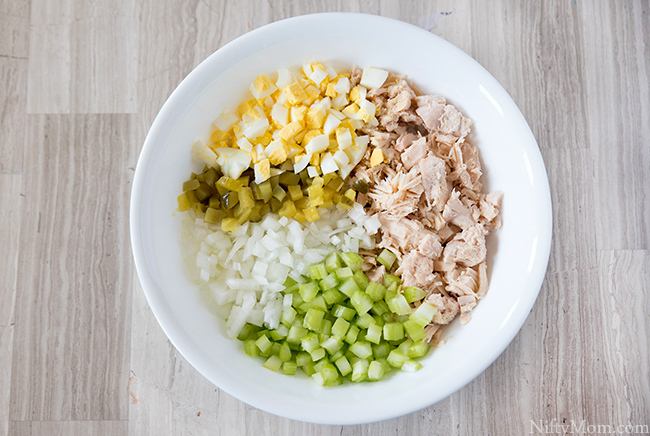 Add the chicken, diced celery, onion, pickle, and eggs to a large mixing bowl. Mix together, adding in the mayonnaise. Ensure all the ingredients are coated with mayonnaise. Add a little more if necessary. The great thing about this recipe is you can easily eyeball the measurements and adjust based on taste. Once mixed, add 1-2 squirts of mustard and a splash of pickle juice. Again, you can add more or less, if desired. Mix thoroughly and add pepper and garlic salt, to taste. Refrigerate in a sealed container until ready to eat (up to a couple days). 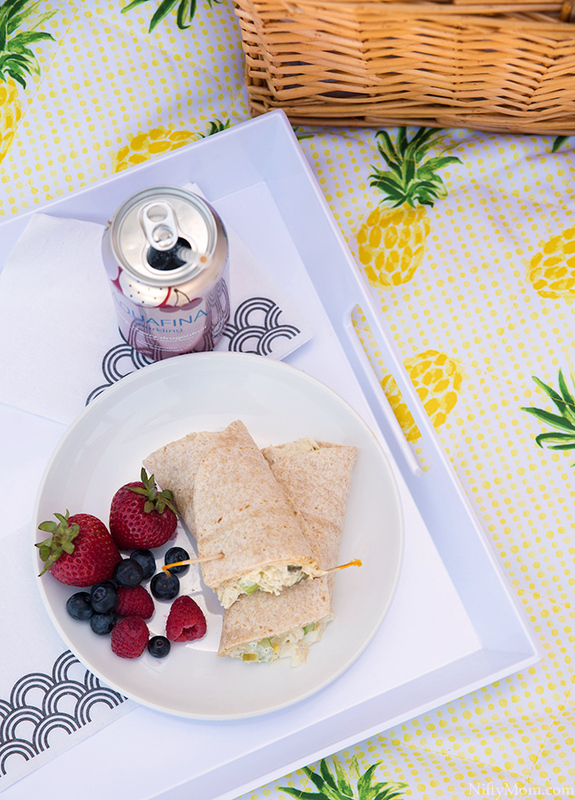 When we are ready for our adventure for the day, I fill an insulated picnic basket with a container of the already-made chicken salad, some whole wheat wraps, fresh fruit and Aquafina Sparkling. This is just for the adults, the kids pack their own lunch (which they love doing). After our walk or hike, we find a relaxing shady spot to cool off. 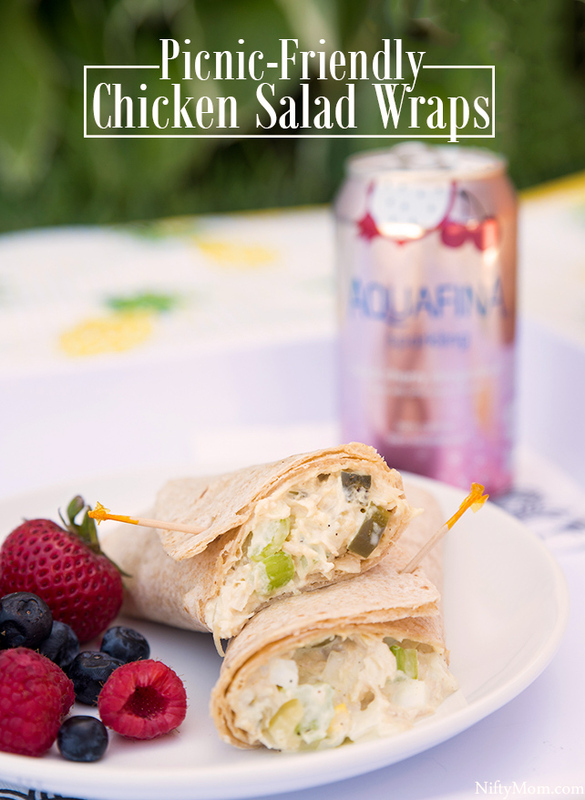 When ready to eat, the chicken salad is simply added into a wrap. The recipe is versatile and can also be great on bread, toasted bread, croissants and more. For more recipes and summer inspiration, visit here. Have you tried Aquafina Sparkling? What’s flavor is your favorite?